The number of steroid users seeking help is doubling year on year according to health officials and charities. They suggest around 100,000 people across the UK are now using them despite side-effects including liver and heart problems, premature hair loss and shrinking testicles. But users say if taken correctly they can help people get bigger muscles within weeks, instead of months. The government says anabolic steroids are harmful. 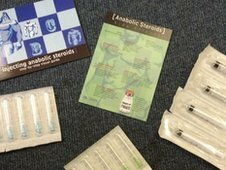 He added there’s been a big shift away from traditional users of needle exchanges, like heroin addicts, to new ones who are much more likely to take steroids. “A lot of them are very intelligent, a lot of them are working, a lot of them are well informed about their drug use,” said Mike Linnell. One 22-year-old user from Middlesbrough, who gave his name as Jonathan, says he’s been using them for about one year to help him compete in power lifting. “Although it’s not an addictive drug people get addicted to the results,” he said. One of the major problems about using anabolic steroids is getting hold of them. They are easily available online and in gyms, but Jonathan says often people don’t know what they’re buying. “If you’re getting it off the internet it could be anything,” he said. It’s now illegal to import them for personal use using postal, courier or freight services. Possession or importing with intent to supply, which includes giving them to friends, is also illegal and could lead to 14 years in prison and an unlimited fine. Neither new or old laws stopped 26-year-old Ryan using steroids for 10 years. “It is a confidence boost,” he said. But he said he stopped using them after suffering from so called ‘roid rage. “You think you’re having a good time and then you wake up the next morning and all your mates tell you you started fighting, you were proper nasty,” he added.